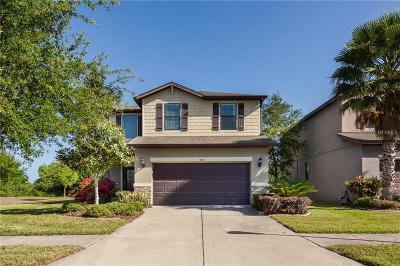 Beautiful 3 Bedroom 2.5 Bath Home in the gated, maintenance free community of Magnolia Park. Additional office/study could be used a 4th bedroom. This gorgeous corner lot home has been recently repainted inside. As you walk in to soaring ceilings in the foyer entrance you'll notice the beautiful Chandelier and elegant ceiling medallion. No carpet downstairs with 18 inch tile entry and hardwood floors in the huge living room. Open concept to a chefs dream kitchen with tile throughout, stainless steel appliances, granite countertops and espresso cabinets. ½ bath is located on the first floor near the entrance. Upstairs you will find a huge master suite featuring tray ceilings, lovely view of the backyard with walk in shower and oversized soaking tub plus walk in closet. 2 additional bedrooms share a full bath. 4th room upstairs can be used as an office, media room or another bedroom. Updates throughout the home include crown molding downstairs, lovely glass front door, Smart thermostat, Smart garage door with phone access and Ring doorbell. No rear neighbors and a conservation view. Reverse Osmosis system, water purifier, water softener. A short 5 minute drive to all north Riverview and Brandon have to offer including Brandon mall, shopping, dining and easy commute from the Selmon Expressway. Community includes basketball courts, pool, and best of all, included lawn maintenance for your yard. Never mow again! In front of the home features wide open park space and extra guest parking for your convenience.